Earlier this year Cargolux Airlines and Emirates SkyCargo announced the start of a strategic operational partnership with the two carriers working closely on a number of operational areas including block space and interline agreements, aircraft charter, hub connectivity between Dubai and Luxembourg and cargo handling cooperation. The partnership has been off to a successful start with Emirates SkyCargo commencing weekly freighter services to Luxembourg from June 2017 and Cargolux transferring handling for their freighter flights at Dubai World Central (DWC) to Emirates SkyCargo in September 2017. Since July 2017, Emirates SkyCargo has also chartered Boeing 747 freighter aircraft from Cargolux’s fleet. The new codeshare partnership between the two carriers is a progression of the operational partnership under which both carriers would now be able to procure cargo capacity on each other’s flights and then offer it to their customers under their own air waybills and flight numbers. The codeshare agreement will be applicable for cargo capacity on both passenger as well as freighter flights. “Over the last five months our operational partnership with Cargolux has gone from strength to strength. We have achieved a number of the milestones that we had targeted at the outset,” said Nabil Sultan. “We will now be able to deepen this partnership through our codeshare agreement and offer a more seamless and broader range of product and service offerings to our customers,” he added. Minister Bausch and a senior delegation from Cargolux visited Emirates SkyCargo’s facilities at Dubai International airport and Dubai World Central earlier during the day. 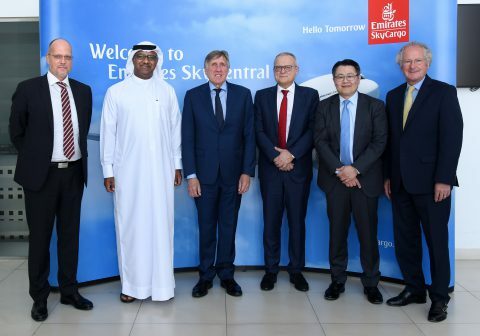 Emirates SkyCargo and Cargolux will continue to explore opportunities to further strengthen their operational partnership and build on mutual strengths to offer customers the highest standards of air cargo transport services.